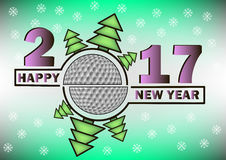 I hope you all had a great Christmas and are now looking forward to some winter golf. The 12 Hole Winter Eclectic begins this week, weather permitting for 7 rounds. Sign up as usual online. Sign up opens 3 weeks in advance of each round. It is filling up already. Please check the status of the competition a few days before just to confirm who you are playing with in case you need to contact your partners if you are unable to play. As you will have seen we are now starting at 9:20am. Please try and avoid leaving gaps between tee times. 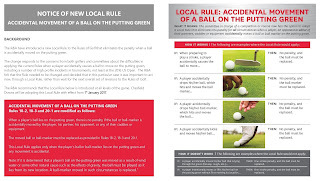 With effect from 1st January 2017 a new local rule comes into force which eliminates the penalty when a ball (or ball marker) is accidentally moved on the putting green. Click here or on the image below to read full details on this new local rule. You can also find a link to the document on our Forum under the Rules Of Golf section. The HCLGA coffee morning is being held on Monday 6th February at Porters Park. Tickets will be on sale on Tuesdays & Thursdays in January. I am very much looking forward to being your Captain for 2017. Looking forward to seeing some fantastic scorecards, eagles and a few holes in one.